The Corpus Christi District services the following counties: Aransas, Bee, Goliad, Jim Wells, Karnes, Kleberg, Live Oak, Nueces, Refugio and San Patricio. 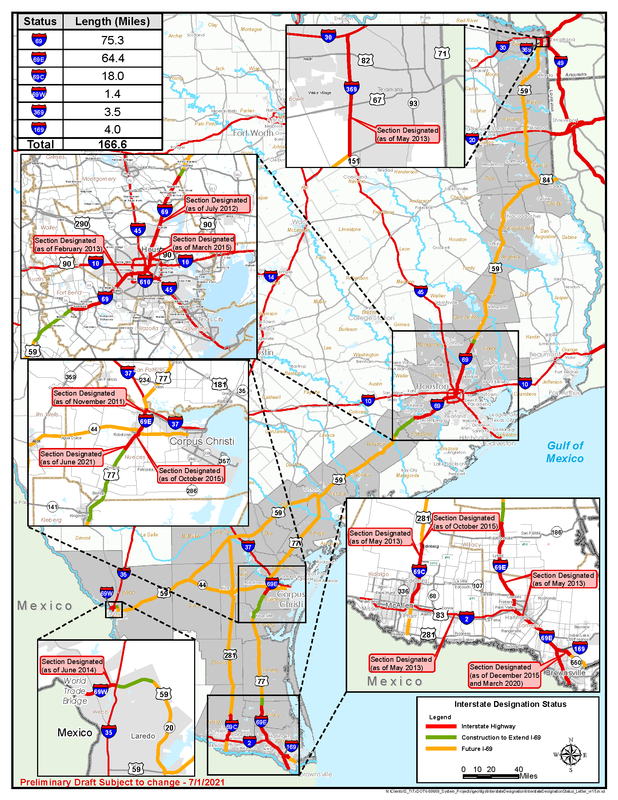 The district designs, builds, operates and maintains the state transportation system across county lines. In this district, 1) US Highway 59 from the Victoria/Goliad county line to the Jim Wells/McMullen county line, 2) US Highway 77 from the Victoria/Refugio county line to the Kleburg/Kenedy county line, 3) US Highway 281 from George West to the Jim Wells/Brooks county line, and 4) State Highway 44 from Corpus Christi will be developed to meet interstate standards as part of the I-69 system development. Learn more about future I-69 projects by clicking on the highlighted areas on the map below. Projects are also listed under the map for quick reference and additional information. All construction dates above are tentative and dependent on available funding. * For more project information, click the link on the project area map above.